Farms are not very angular places and I will admit, my eyes are drawn to curves and not angles. 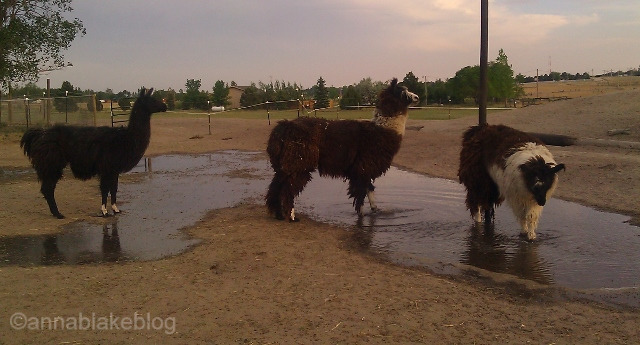 Llamas are the closest we get to angular animals: straight backs, perpendicular necks, directional ears. They have an angled silhouette that is easy to recognize. Llamas are also quirky and peaceful and curious. And prone to wading. ← Abuse -When do you speak up? Ingenious take on angles, Anna. I’ll never look at llamas again without seeing those perpendicular necks! Thanks, the babies, or cria, are a mass of pointiness! Love the llamas, I had no idea you had them as well.